Smartphone RPG due out later this year in Japan. Square Enix has officially announced Kingdom Hearts: Unchained χ for smartphones following its magazine reveal in the latest issue of Weekly Famitsu. The first smartphone entry in the Kingdom Hearts series, the free-to-play RPG (with micro-transactions) puts players in the role of a Keyblade user. 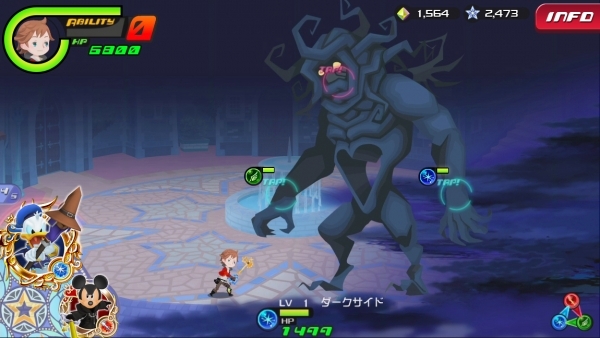 Players can strengthen their Keyblade and gather character medals while exploring various Disney worlds. The story progresses by clearing stages. As for the battle system, the idea is to see how few turns you can end the battle in—the pursuit of the one turn finish. Additionally, the story connects to the upcoming Kingdom Hearts III, and also depicts the oldest times of the series. Kingdom Hearts: Unchained χ is due out in Japan later this year. Visit the teaser website here. View the first screenshots at the gallery.